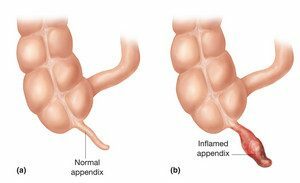 What is the Appendix, and what is Appendicitis? Your appendix is a finger-shaped pouch that attaches to your large intestine. It is found in the lower right side of the abdomen. When healthy, the appendix is about four inches long, and as thin as a pencil. It may be larger when inflamed. The appendix does not serve any purpose that we know of. Appendicitis is an urgent medical condition brought about when the appendix becomes inflamed. Anyone can develop appendicitis, if they still have their appendix. Most times, appendicitis affects people between 10 and 30 years of age. On a broader scope, one in 15 people may develop this disorder. It occurs more often in men than in women. Appendix pain usually begins in the middle of your abdomen, near your navel. The pain occurs here because the innervation of the appendix enters the spinal cord at approximately this location. In later stages, your appendix and the near wall of the abdomen become swollen and irritated. This results in localized plain in the lower right of the abdomen, except for children younger than three years. The location of pain from appendicitis can be ascertained through signs or assessments. If a physician touches your abdomen lightly, only the specific area is tender. When that pressure is released, your tenderness will become worse. This is called “Rebound Pressure” or “Rebound Tenderness”. Most physicians look for this as a confirmation of their diagnosis of appendicitis. The location of pain can also be determined when specific abdominal areas hurt when you breathe deeply, move around, sneeze or cough. 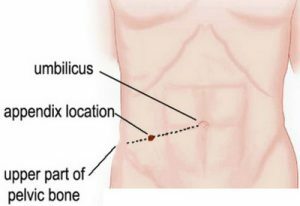 The location of appendix pain is called McBurney’s Point. It is on the right side of the abdomen, which, when measured, is 1/3 of the distance from the anterior superior iliac spine’s to the umbilicus. Appendix pain location and nature do vary. As an example, they are somewhat different in pregnant women and children. This is the main appendicitis symptom. It starts in the middle abdomen area, near the navel. 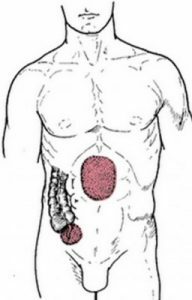 As the condition progresses, the pain will be localized more to the lower right abdomen. The worsening of pain from appendicitis occurs between six and 24 hours. This pain, as described above, becomes more severe after gentle pressure on the abdomen is then released. The pain quality is dull in the beginning, but becomes sharper with time. The pain intensifies when you breathe deeply, sneeze, cough, or move. 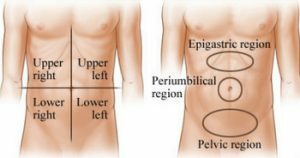 In some cases, pain may be originally noted at the lower right quadrant of the abdomen. Frequent urination – This is caused by irritation of the lining of the ureter, which is located close to the appendix. Infection-related causes of appendicitis are linked to bacterial growth resulting from feces being trapped in the appendix. As bacteria are multiplying, pus and swelling fills up the appendix, which worsens its inflammation. Appendicitis may also be caused by a gastrointestinal viral infection, which could travel to your appendix. The appendix structure is attached to the large intestine, where stool is formed. Some appendicitis cases are believed to result from small stool pieces becoming trapped in the appendix, causing obstruction. Lymph node swelling may also be associated with appendicitis. Other associated conditions include Chrohn’s disease, ulcerative colitis and inflammatory bowel disease. Less-likely possible factors that are related to appendicitis include barium ingested for x-rays, vegetable or fruit seeds or worms in the stomach. Surgery is the only main treatment for appendix inflammation. The appendix is generally removed within hours of the appendicitis diagnosis. The surgical procedure is an appendectomy. This is a commonly used method, since it is less invasive and you’ll recover more rapidly after surgery. Small incisions are made, allowing the surgeon to remove your appendix. 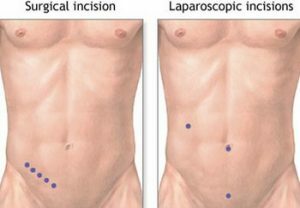 The main incision is usually only 2-4 inches long. During this procedure, special tools and a video camera are used inside your abdomen. In these cases, your surgeon will make one larger cut. 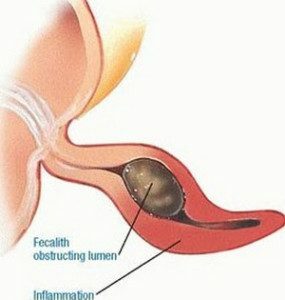 He or she can also clean the cavity around the abdomen with this method, as well. The disadvantages are longer healing time, a longer hospital stay and a larger size scar. If you refuse to have an appendectomy, your inflamed appendix may become perforated. This results in peritonitis, an infection in the abdomen. This is a life-threatening situation. A general anesthesia is usually used, as long as you have not had food or drink in the last six hours. Spinal anesthesia can be used if you have not fasted prior to surgery.